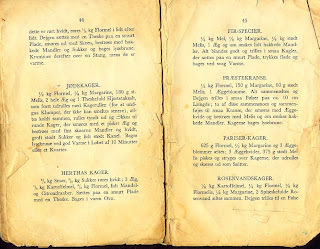 I was just looking up my recipe for Jødekager, actually I have several recipes, each one just a tad different. I wanted to look up the original recipe my mom had in her old cookbook, which is one I scanned in many years ago, cause the original is falling apart, and is missing pages to boot. 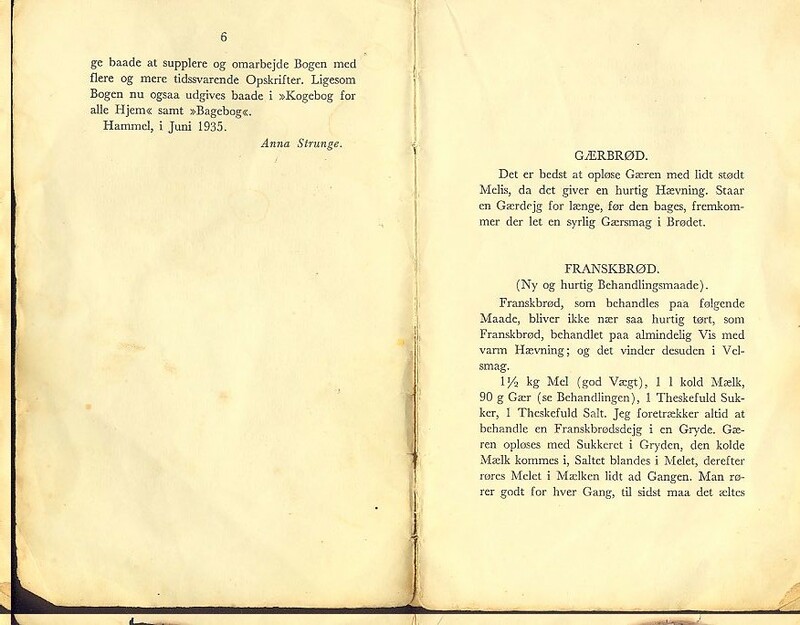 This one is from 1935, it's one my mom had and even though it is in Danish, at least I can read Danish. 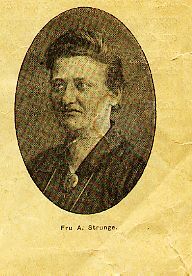 Anna Strunge, rather a severe looking lady, but she did a pretty good job of making a cookbook. She explains how she got started in 1912, and how it all came to be that she finally got this cookbook done in June of 1935. 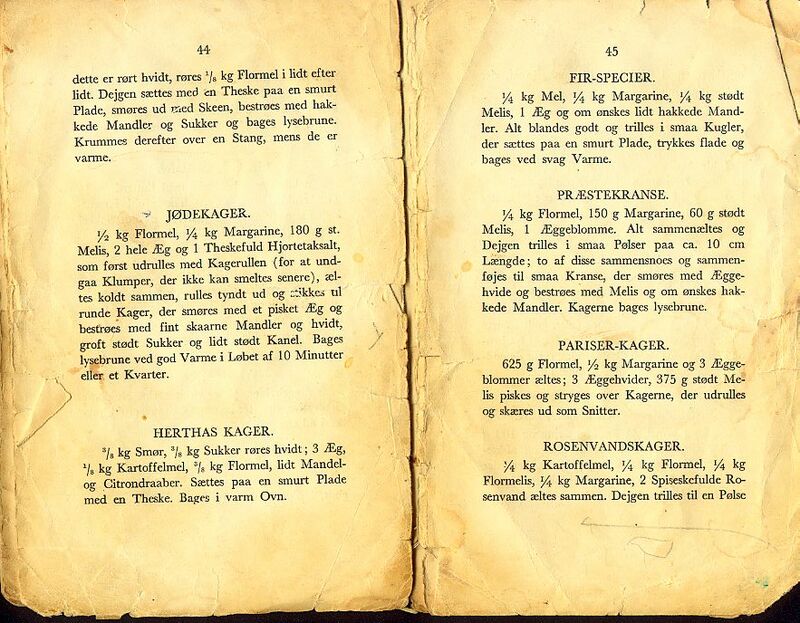 Some of the ingredients she has are hard to come by here, but I got hold of some Hjortetaksalt (Bakers Ammonia) again this years so I am making one of my favorite recipes from this cookbook. However, some of the directions, well, if you don't know how to bake or make stuff, you would be floundering. Some of the cakes tell you to 'bake it in a good hot oven til done', none of this 'bake at 375 degrees for 40 minutes', nope it's a good hot oven til done. I will admit to having to play around with some of the measurements, they didn't exactly have standard measurements back then. They did weigh most ingredients, but some of them, well, we're so used to standard measurements, that it's kinda hard to translate. But then again, one of my favorite cookie recipes calls for 12 soup spoonfuls of light cream. I have no idea how much that really is, and always mean to measure it out, just so I have a reference, but then again, why bother, I know how big a spoon is and how the dough is supposed to feel and gee, I just like using the old fashioned measurements sometimes. complete with a little blue arrow pointing to the recipe, and as you can see, it's dogeared and old. 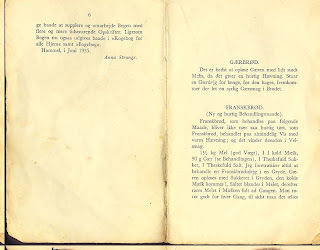 Well, gotta go and get the dough together for the Jødekager now, I'll post the translated version later on, complete with pictures.